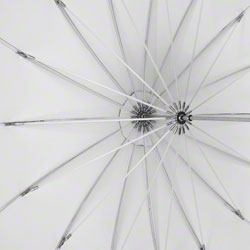 The walimex Translucent Light Umbrella with a diameter of approx. 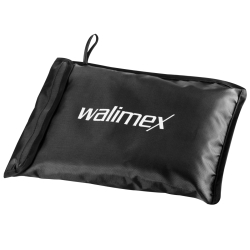 180cm is a space-saving and light-weighted alternative to softboxes of comparable size. It illuminates your motif evenly and softly. Due to its size, it is particularly well-suited for lighting larger objects, small groups or full-length portraits. 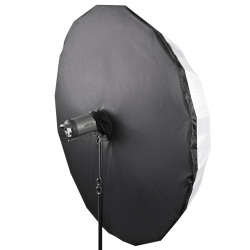 The flexible possibilities of use and the small size make it an ideal companion “on location.” The Translucent Light Umbrella is simply mounted in the umbrella holder of your studio flash. 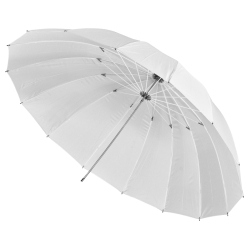 The translucent light umbrella by walimex turns a normal translucent light umbrella into an umbrella softbox. It reflects the light and therefore achieves a higher light efficiency and a soft light characteristic. This makes it very well-suited for portrait, product and still-life photography. 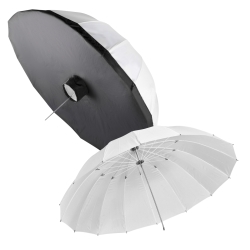 The translucent light reflector and umbrella can be folded flat for transport. They are ideal for mobile photographers.